A new, slightly larger than usual, painting has arrived at Whitby Galleries this week. Something very Scottish and very hairy! 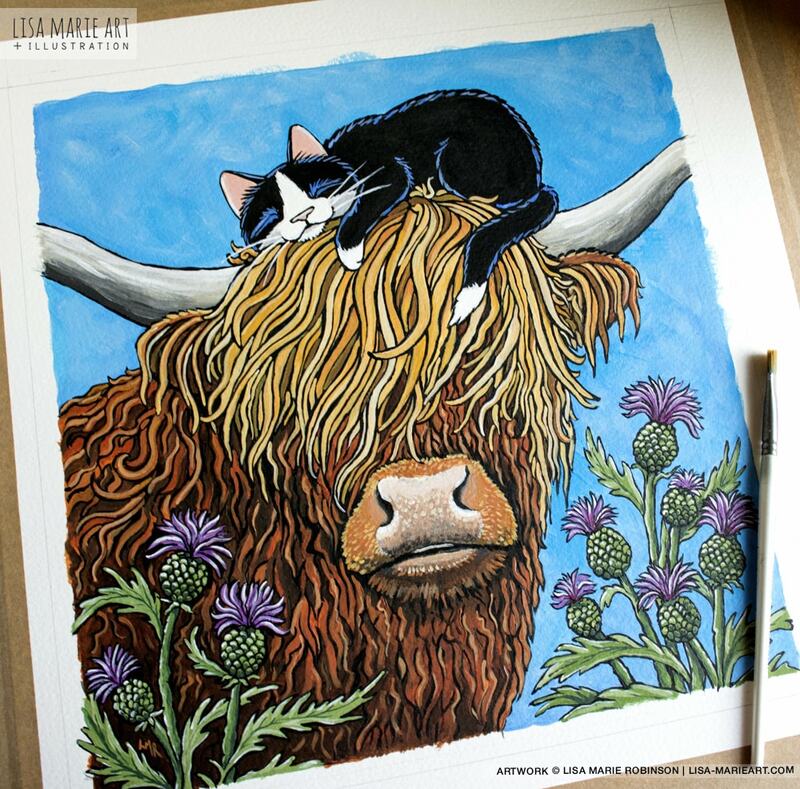 A highland cow & sleepy kitty. If you’ve been following along on social media recently you may have seen another, smaller, cow and sleeping cat. I’ve spent the past month or so working on a charity piece to donate to Twitter Art Exhibit for their annual fundraiser. The staff at Whitby Galleries loved the concept so much that they asked me to paint a larger 12 x 12 inch version especially for them. Fully framed it measures in at impressive 23 x 23 inches. The image above is actually a work in progress pic (I forgot to take another before I posted it) so if you’d like to see the finished artwork hop on over to my artist page at Whitby Galleries’ website. If you are interested in buying or reserving this painting please contact Whitby Galleries directly quoting the ref. no which can be found below. Reservations and orders can be taken by phone, email, or by popping in to the gallery. Alternatively, you can get in touch with them via Facebook. * Sold status and prices are correct as of April 21st, 2019.